HOME MADE MAYONNAISE, YOUR WAY. Develop your own special mayonnaise! 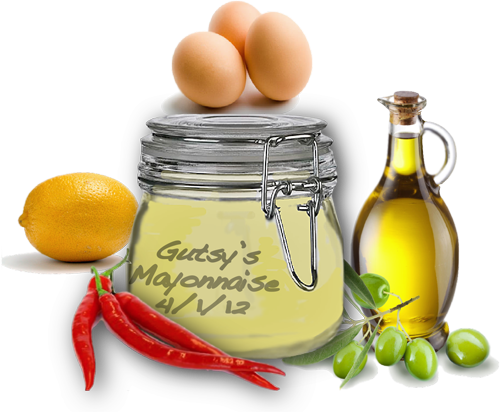 Making your own special mayonnaise is easy, and you can avoid all the additives you would get in store bought mayo. The flavor is going to be special as well. 1. Separate the 3 eggs and place the yolks in a stove-top Pyrex® mixing bowl with vinegar, water, and lemon juice. on counter-top. This heating will reduce the risk of (salmonella) food poisoning. point. Go light the first time you make your mayonnaise until you get the exact flavor and thickness you want. before you add the next. 1. Raw eggs are raw,  and you always run the risk of salmonella contamination. The best protection is to use pasteurized egg yolks. buy in the supermarket,  so please take the proper sanitary precautions. 2.. I like using a buttery tasting olive oil and not the strong peppery variety. Olive oil if too strong will overwhelm the mayonnaise. oil. Even flax seed oil,  canola oil or even sesame oil will work.